In this article you’ll discover findings from studies to help you determine which metrics to use to evaluate your social media efforts. 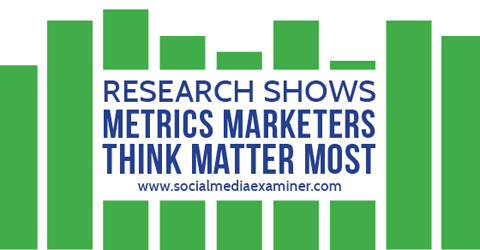 Research shows the metrics marketers value most. In August 2014, Duke University’s Fuqua School of Business along with the American Marketing Association surveyed 408 chief marketing officers and 4,582 marketers total to gauge how metric choices and priorities have shifted over the past four years. As the eMarketer chart below shows, four years ago in August 2010, nearly 18% of marketers used sales as a metric for success. By August 2014, that number had actually dropped by 1% to 17%. Further, using “profits per customer” as a metric dropped from 9% to 6%. Also, following “revenues per customer” dropped from 17.2% of all marketers tracking this metric to 12.5% in 2014. Using revenues and sales as metrics for social media success has waned. 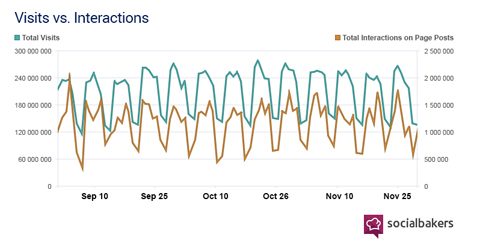 During the same period, brand awareness–type metrics rose significantly. Tracking numbers of followers/friends, for instance, nearly doubled from 24% to 45% in the same four years ending 2014. “Buzz indicators” enjoyed nearly a 50% increase, also indicating prioritization of brand awareness over sales and profits. Interestingly, the top metric, “hits/visits/page views,” remains the most-used, with an additional 30% of marketers relying on it in 2014 than in 2010. This metric, too, can fall into the brand awareness category, as it brings visitors back to websites where brand identity, offers and conversion opportunities live. Despite the difficulty tying sales to social media or even proving social media has an impact on revenues, tweeting and updating continues at a furious pace. Duke University’s CMO Survey reports that social media as a percentage of marketing budgets now stands at 9.8%, but is expected to rise to 21.4% over the next five years. 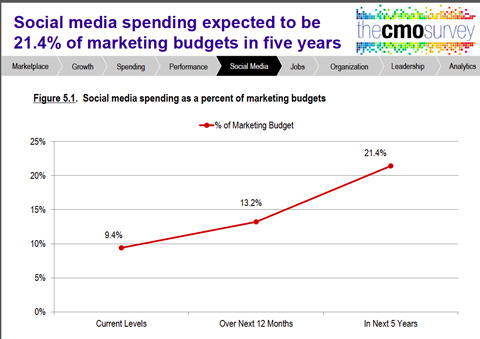 Spending on social media marketing is expected to double in the next five years. In fact, Simply Measured’s Quarterly Facebook Network Study (Q3 2014) of 100 of the top global brands reveals that 65% update Facebook at least five times each week and 97% have Facebook pages. Clearly, companies are convinced that the brand awareness that social media provides has value, despite its intangible nature. Key Takeaway: Marketers are well aware that social media marketing is not driving sales directly. Despite an absence of dollar return on investment, they view social media impact as worthwhile and intend to allocate more money to social media marketing over the next five years. Since its inception, social analytics company Socialbakers has encouraged companies to use its “engagement rate” metric to compare success against competitors. Engagement rate is the number of likes, shares and comments divided by the number of audience members. Socialbakers concluded that competitors with higher engagement rates were producing more powerful social content. Findings from their 2014 study of 300,000 Facebook posts from more than 2,700 businesses, however, have prompted them to change this recommendation. With the rise of news feed advertising, Socialbakers explains that the engagement rate metric has become skewed because many brands now pay for reach, at least on Facebook. They’ve switched their recommendation for top metric to absolute count of interactions. Mining their data from the large study, they report in How Social Engagement Drives Site Visits that the number of absolute interactions correlates directly with website visits. Here we can deduce that if a brand garners a high amount of Interactions from their social media activity, there is a high probability that it will increase traffic to their websites. Every like, share, comment and retweet on social channels raises the number of consumers going back to the company website to be exposed to brand identity and offers to sign up for an email newsletter, call or even buy. Useful Social’s State of Corporate Media 2014 echoes these findings. “Engagement” and “web traffic” stand at the top of their preferred metrics list for measuring social media engagement, too. Useful Social, too, found marketers relying most on engagement/interactions metric and website visits. Key Takeaway: Social media is doing something: it’s getting consumers to interact with brands and channeling them to websites. Each company must decide whether this amounts to sufficient value. Forrester reminds us that just because most marketers are using engagement/interactions and website visits/hits metrics, it doesn’t mean marketers SHOULD rely on them. The research giant’s December 2014 report Stop Measuring Social Engagement concludes that engagement rarely translates into sales or customer loyalty. A business is in business to make money after all, and if social media cannot clearly prove it drives direct sales, marketers may want to reassess their fascination with it (see the above prognostication that social media marketing spend will double by 2021). Popularity contests do not necessarily pad the bottom line. Forrester encourages marketers to put more energy into email marketing where measuring customer lifetime value and customer loyalty is far more clear and conclusive. Customer Lifetime Value is a clear and conclusive metric. Image: Shutterstock. Key Takeaway: The Forrester study’s authors insist that social media prove itself in terms of return on investment measured in dollars. If that can’t be done, budget and effort should be diverted elsewhere. The futility of measuring the value of brand awareness in the abstract will resonate with some companies. Social media’s impact on either profits and revenues or the more abstract measurement of brand awareness is proving difficult to measure, even for Fortune 100 companies. The many steps and interruptions that can occur between a social channel interaction and purchase cloud how sales are actually won. It’s not surprising then, that most marketers don’t have a clear picture of dollar amount their social media efforts add to business profits. Although some companies are creating “attribution models” that measure the various paths consumers take from acquisition channels like social, email and website to a sale or conversion, these figures aren’t tracked accurately as of this writing. 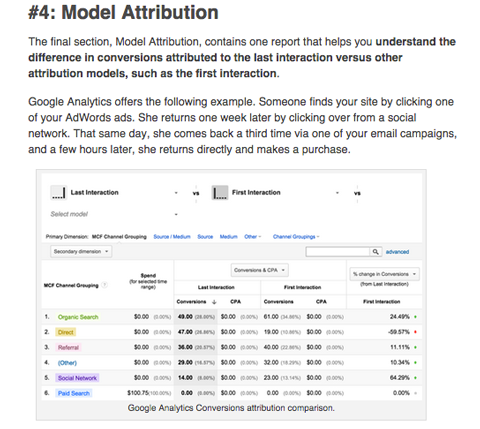 This recent Social Media Examiner article explores attribution models in more depth. 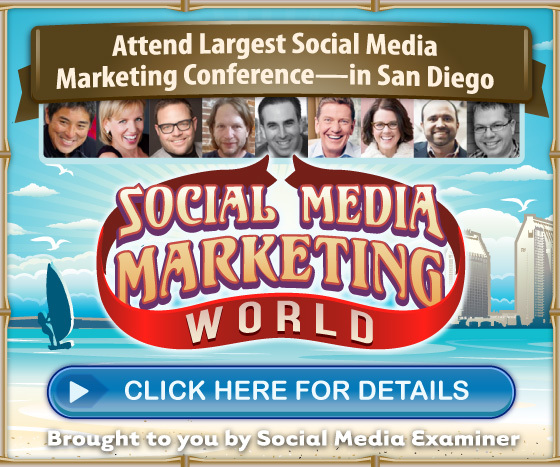 Explore using attribution models in this article from Social Media Examiner. Just because the return on investment cannot be tracked in dollar amounts, however, doesn’t mean that social media has no effect on a business’s success. Brand awareness has been shown to drive revenues and profits, and social media has proven to raise brand awareness. The most encompassing way to measure social media success would be to track how overall business revenues and profits correlate to increasing or decreasing social media efforts. Still, many marketers believe having business goals that aren’t directly revenue-focused can add to the bottom line over time. Some are confident that changes in reach, audience numbers and interactions are the concrete metrics that measure brand awareness. What do you think? Does your company set objective goals for measuring brand awareness? What metrics do you use? Are you being asked to prove return on investment in dollar amounts? Leave your comments and questions in the box below. 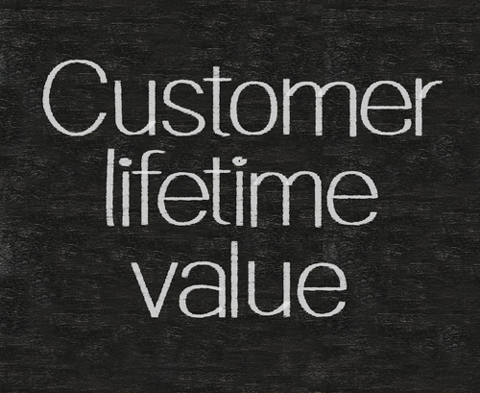 Customer Lifetime Value photo from Shutterstock.